I'm always trying to broaden my reading horizon...or at least that's what I always imagine doing when I pick up a new book. I've been better about it this year, but my first choice reading will always be Romance. I don't need the bosom talk or the dirty talk I just need someone to fall madly in love and for them to live Happily Ever After - hence the blog name. 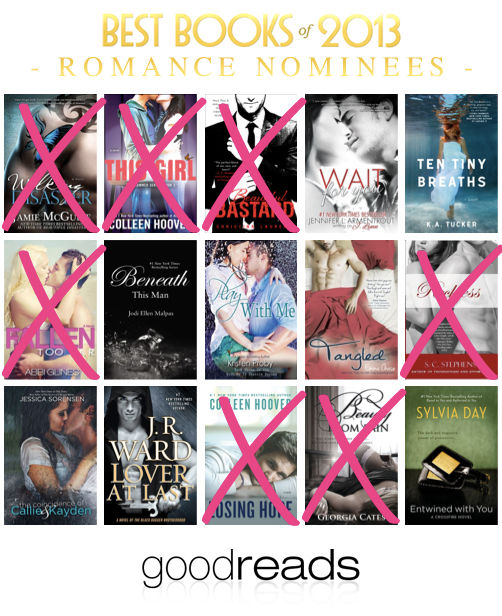 I remember at the end of 2013 when Goodreads was having people vote on their top Romance read of the year, they had other categories too but Romance was where I was voting. So, I decided to screen cap what was at the time, the top 15 on 11/04/13. Now, from the time of my screen grab and the end of the voting some of the books have shifted but I've been working off of this list so I'm not going to redo it at this time. In fact the one that took it all was toward the bottom when I screen capped this and all of the ones in the top 12 are pictured in my top 15. I put an 'X' over the books I've read and I'll slowly be working my way through the list this year. Just another list I can pull books off of. I'm currently speed listening (that was the only available format and it's free so I can't complain) to Eleanor and Park via Overdrive since it's due Thursday and then I'll be starting Labor Day which will cross another off my 16 books to movie list I'm working on. After I finish what I have borrowed, I need to read my non-fiction book - It Starts With Food. What are you reading or thinking about reading? Girl since I got introduced to Netgalley I have like 5 books I need to read plus five more from the library. I am in book heaven! Now to be able to just sit and read. Hmm. I'm currently reading Beautiful Creatures (I'm so behind the times!) and since I bounce around I probably won't read the second book in the series until later. I have SO many books on my kindle and on my bookcase that I have a hard time deciding what's "next". As if you needed another list! Ten Tiny Breaths is on my Kindle now through netgalley! I'm currently reading the Divergent Trilogy which I was so hesitant to start, but its awesome! Such a quick interesting read for my morning commutes!